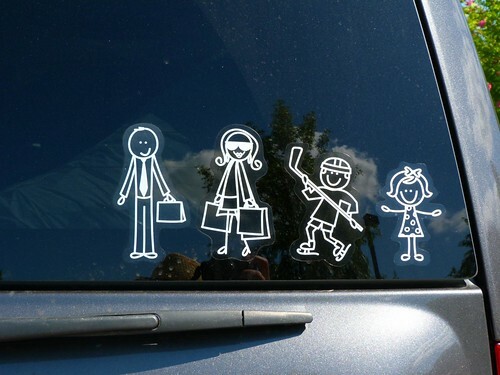 Family stickers can be seen zooming around town on cars and vans everywhere. Family stickers are easy to install and are a great way to show off your family. They are not too ostentatious or gaudy and give a nice family feel to your vehicle. Why not show off your precious cargo? Family stickers can be applied in a flash by following these easy how-to instructions. Take your family stickers out of the package. Smooth the stickers and paper backing out. You’ll want them to lay flat and not be wrinkled. Find a place for them on the back window of your vehicle. The family stickers should be placed on a flat section of the glass and should not be in the path of a rear wiper blade. You wouldn’t want any of your sticker kids to be swept off your window! Clean the window you have chosen to apply the stickers to. It is important for all grit and dust to be completely removed. Make sure the window is not too hot. Your family stickers will develop air bubbles if the glass is hot to touch. Applying the stickers in the dead of winter is not advisable either. The temperature should be at least 55° F.
Lay your family sticker face down on a flat surface. Peel off the backing on a sharp angle. The stickers should all be attached to the transparency. Hold up the sticky transparency to the approximate place on the window. Once your position is good, pull the transparency taut and stick one edge to the window. Use a firm swiping motion to apply the rest of the transparency sticker. Make sure there are no creases, wrinkles or air bubbles. Use a flat edge flexible tool, like a plastic squeegee, to smoothen the sticker. Start in the center and sweep to the edges. After the sticker has been firmly applied, remove the transparency sticker. Start from one edge and slowly peel of the transparency sticker in one smooth motion. If the family sticker should come off with the transparency sticker, apply the transparency again and slowly peel back one more time. Use your fingernail to coax the sticker off if necessary. A serial number will be part of the sticker, but this can be easily peeled off of your window. Carefully smooth the sticker over with your hand to make sure that no piece of the sticker is sticking up. Don’t wash your car for a couple days after applying the stickers. When the snow flies, don’t scrape that part of the window with a scraper. Now that your family is nicely represented on the back of your vehicle, you are ready to roll. What characters have you chosen for your sticker family? Guest author Greg Smith is a family sticker addict. He thinks they are hilarious! In fact, he started a blog with pictures of some of his favorites. Right now, Greg is loving the zombie family stickers.